Pro Golf Discount franchise business opportunity. Free Pro Golf Discount business franchise information. Golf is a game of great passion. Success in business requires tremendous passion and dedication. If you have a passion for golf and a passion for success in business, Pro Golf Discount can provide you with the brand, tools and resources to make your dreams become reality. 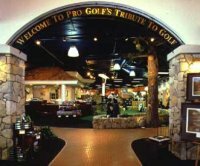 The oldest and largest "Golf Only" franchise network in the world, Pro Golf Discount has been in business since 1962. With locations worldwide, our store owners are recognized throughout the golf industry as successful, dynamic leaders in golf retailing. As a Pro Golf Discount franchisee, you will be a part of a team that sets the standard. The future is bright. The golf market is growing, dynamic $25 billion industry. The aging baby boomer trend is one big factor in a healthy long-term growth picture for the golf market. And media interest in the game continues to grow. Currently, we have identified prime franchise territories, based on local market conditions, which offer significant growth potential. These opportunities, as well as Master Franchises, are available in the United States, Canada, Europe and Asia. A Recognized Brand that's Your Greatest Asset. When you make the decision to buy a Pro Golf Discount franchise, you're buying a number of things: the tangible services and materials provided, as well as a number of vital intangibles that are unique to Pro Golf Discount, and can make a big difference in your success in the golf industry. Of these intangibles, the brand equity and consumer acceptance of a company that's been in business serving golfers' equipment needs of 40 years will have the greatest impact on your business. The name has respect among golf equipment, apparel and accessories vendors. 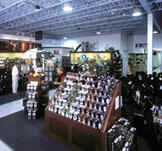 It also has an established market position as the #1 place to shop for service, selection and low price. At Pro Golf Discount, we are absolutely committed to your success. The most valuable asset we share with our franchisees is our golf retail training program. Decades of market-proven experience is put at your disposal to insure that your business is run with an understanding of the best practices and most innovative selling concepts in golf retailing. Pro Golf Discount offers the total package. From the day you sign your agreement, we're by your side to make your business run smoothly and profitably. Desirable franchise opportunities exist in several prime areas in the United States and Canada. We also have International opportunities for individual and Master Area Franchises in the following international markets: Africa, Asia, Australia/New Zealand, Central America, South America and Europe. To learn more about the Pro Golf Discount store franchise opportunity, simply complete the form below.